One of the most popular attractions for kids in St Louis, the St Louis City Museum isn't a stuffy hall with dusty dioramas. It boasts attractions like a ten-storey slide, a rooftop Ferris wheel, treehouses, enchanted caves, a 200-year-old frontier cabin, an aquarium, and much more. There are also educational exhibits on natural history and architecture, and special play areas for toddlers. There is a gift shop on the ground floor and several cafes throughout the building. 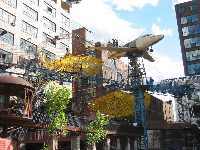 With a reasonable admission charge and so much on offer, the St Louis City Museum is definitely a must for those travelling with kids in St Louis.